PolishPierogi.com Blog: NEW Retail Locaitons! Market on Broadway, aka the Beechview IGA. Both locations are currently stocked with Potato and Cheese, Potato and Onion, Potato Cheddar and Sauerkraut. 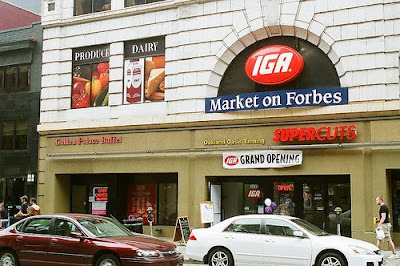 If you work in Oakland, the IGA is a convenient place to stop and pick up some pierogi for dinner. In Beechview, the IGA is located right along the red line for the T and our pierogi are located in the freezer cases as soon as you enter the store. For our other retail locations, addresses and phone numbers of stores near you, please visit our website.